The code collaboration market continues to see new entrants, which illustrates the growing power of the enterprise developer. Perforce is the latest entry to the market with Swarm, a collaboration platform for continuous integration and delivery. Before apps ever go into production, all the pieces in the development cycle need to be in place. People work across distant geographies, and their platforms need to be synced. To compete effectively, developers must collaborate on the code they write. With Swarm, Perforce enters a market that literally is starting to see a swarm of competing companies. Swarm is the next step in a new direction for Perforce, originally founded in 1995 as a developer of version control software. The company gave glimpses of its new direction in March when it launched Commons, an open-source document management service, similar to Dropbox or Google Docs. Version control is integral to file storage and sharing services, giving Perforce a natural entry into that sector of the market. Swarm has the look of a tool that we’d see from a modern services provider. It puts a premium on its user interface while also keeping its roots in software configuration management. It has an activity stream, RSS feeds for updates, comments changes and reviews. A user can see code in side-by-side comparisons, and it can capture comments on the code in-line. Swarm also gives hooks into a build and test infrastructure. A user can see if a commit has passed build and test it before approving and merging the change. The technology is open source with PHP, built on a Zend Framework and coupled to Perforce, which stores everything including code, assets, and metadata such as comments and review status. 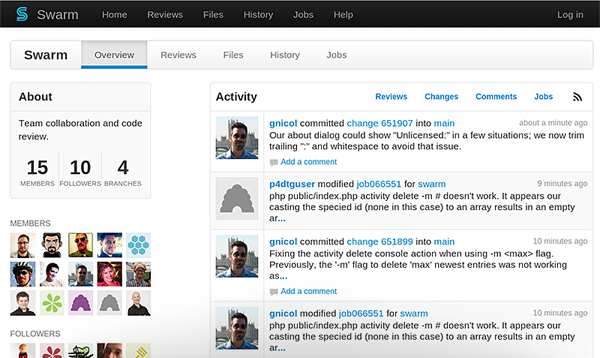 Swarm servers scale horizontally, and the Perforce versioning service scales by adding replica servers. It is available for installation on a company’s servers. A cloud version is in development. Like a number of enterprise players, Perforce has its own legacy technology. That’s an issue in today’s market, which is increasingly seeing lightweight services emerge. It will compete with providers such as Atlassian Bitbucket and GitHub. With its focus on continuous integration, Swarm will also face CircleCi, Jenkins, Wercker, CloudBees and CloudMunch in a developer market that continues to grow.